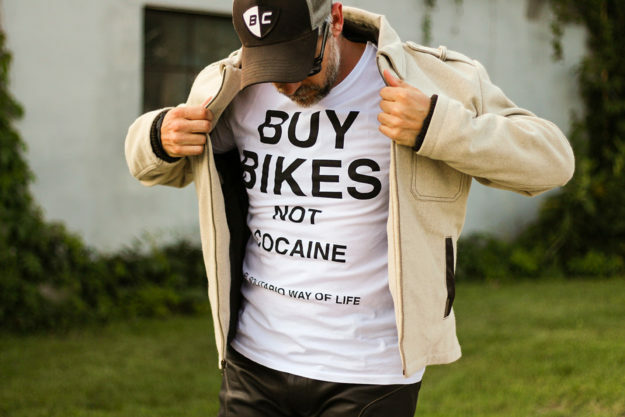 We’re always trying to unearth motorcycling’s latest and greatest apparel around here. So we cast a pretty wide net, and whittle our catch down to the finest of gear. But every now and then, kit from lesser-known, independent makers gets dragged in with the haul. These indie gear gurus don’t have corporate bean counters to appease, so they can take chances the big names won’t. New and interesting styles are developed, different fabrics are experimented with, and some exquisite protective pieces are created. Here are three of the best indie brands I’ve found lately. Aether Moto Gloves I’m an unapologetic fanboy of Aether Apparel: their gear consistently nails that balance between aesthetics and functionality, and everything is built to last. Company founders (and avid riders) Jonah Smith and Palmer West not only scrutinize every product to receive their stealthy logo, but also put their products to the test themselves. That means rider-specific features that some big names miss during the design process are caught and created. 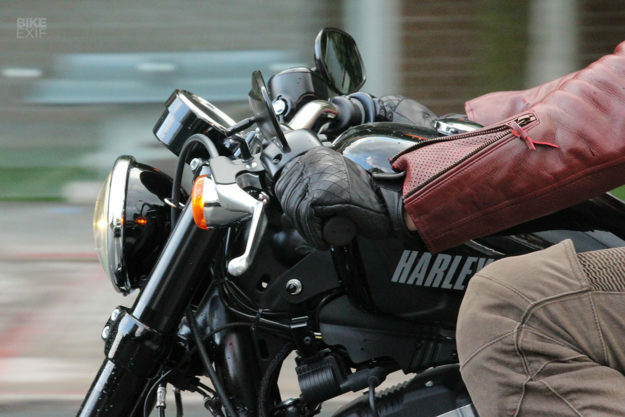 The latest piece of gear to survive Jonah and Palmer’s riding rigors is the Moto Glove, an all-leather, short cuff mitt that has quickly become my go-to this summer. I’m picky when it comes gloves. I want my hand protection to feel almost non-existent on the controls, but beefy enough to save my skin if I take a tumble. And the fit needs to be spot on. 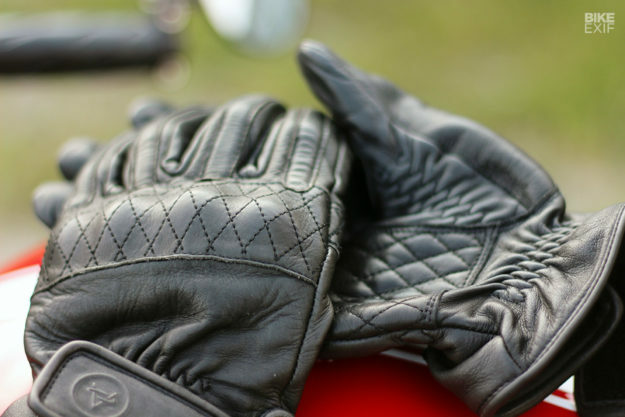 To that end, the Moto Glove delivers the goods with soft, pliable leather for the fingers that’s all-day comfortable, plus an attractive diamond-stitched, secondary layer of protection at the palm. The party piece, though, is an elasticized panel that runs along the fleshy part of the thumb. It delivers a fit that few gloves can match, and allows the thumb to flex properly whenever your fingers aren’t curled around a grip. It’s that little bit of ingenuity, a simple solution that makes all the difference in the world. 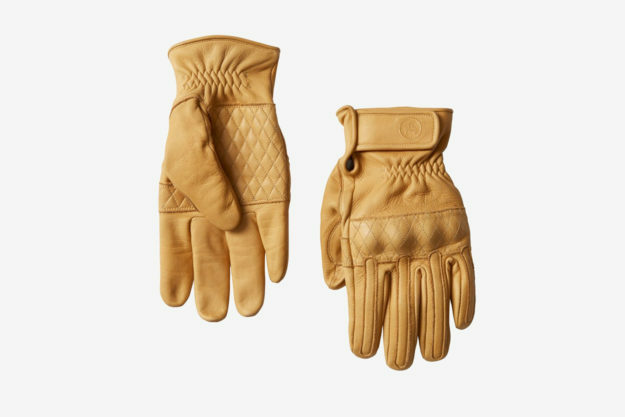 There are additional leather runners atop each finger and a thin, flexible layer of armor sits beneath the continued pattern of diamond-stitched detailing. A large Velcro closure flap resides at the cuff and two more elasticized panels, both top and bottom, keep things sealed at the wrist. Vaktare Bomber jacket Vaktare owner and lead designer Estefan Duarte wasn’t impressed with the cookie cutter products in his local shops. So he started making his own. 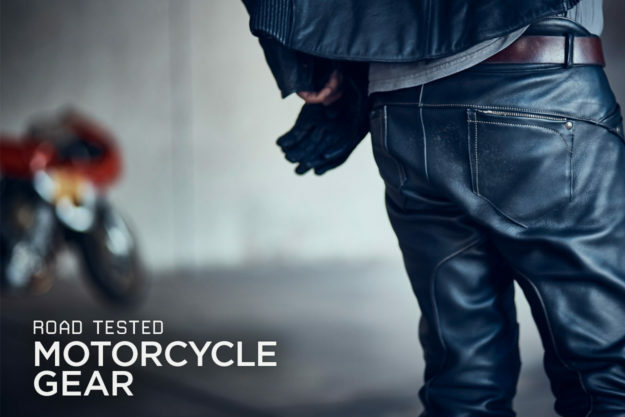 Designed and manufactured in Los Angeles, California, Vaktare (pronounced ‘Victory’) Motorwear Company is a small upstart that’s taken a unique approach to riding gear. I was first introduced to their products just over a year ago when they launched a protective Peacoat named the Draugr. 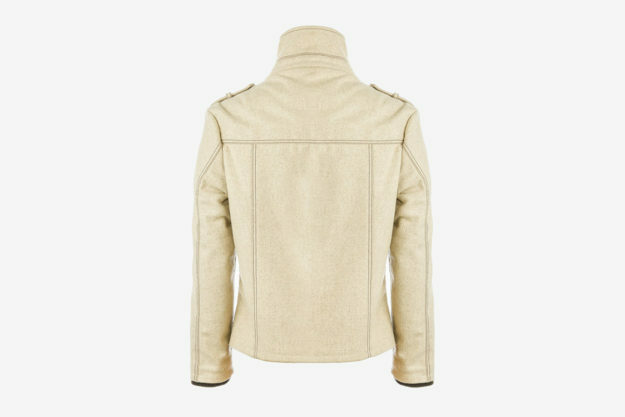 It was a decidedly fresh take on a riding jacket that broke all molds of convention by being a fashionable coat, made from wool, but designed with riding in mind. On the aesthetic side of things I can honestly say the Bomber has grown on me. At its core it’s a jacket with a tried and true design that stays true to its aviator roots. I dig the inclusion of epaulettes, and the contrasting brown touches at the pockets, cuffs and stitching add some subtle sophistication. Be warned though, this jacket will grab attention. You need to be prepared to answer questions at stoplights and when you get to your destination, because it doesn’t look like anything else on the road. The only thing you need ask yourself, stylistically, is whether a white coat is something you can pull off or not. If you can, know that the fit is similar to a tailored trucker jacket. On my 6-foot, 200-pound frame, that means a size 42 delivers a touch more room in the shoulders to allow movement in the saddle and hugs comfortably at the waist. The sleeves are cut to fall just beneath my cuff, so they sit pretty both on the bike and off, provided the bars on your bike sit low. With a high bar, the extended reach causes the jacket to rise, devouring your neck, resulting in an ill fit and boxy look. I spoke with Estefan after wearing the Bomber for a bit and let him know about my issues. My guess is a stretch panel between the shoulders or a more articulated, radial sleeve style would help, but I’ve left that in his capable hands. Also, if you like to layer, jump up a size from your normal suit jacket choice as the fit runs slim. In terms of protection the Melton wool outer is of the 14 oz. variety. That means the fibers that hit the road first are a bit tougher than an equally thick denim jacket, but the true protection of all Vaktare products actually lies beneath. A layer of 1000D Cordura lines the entirety of the jacket, which handles abrasion in a fashion similar to Kevlar but doesn’t offer the same level of heat resistance. On top of that, there are pockets integrated into the silky smooth Bemberg liner at the shoulders, elbows and back. The only downside here is that Vaktare do not supply armor, so you’ll either have to swap some out from another jacket or pick up an extra set. I slotted in my own D30 bits and there was little disruption to the fit. In the elements, the Bomber again performs reliably well. 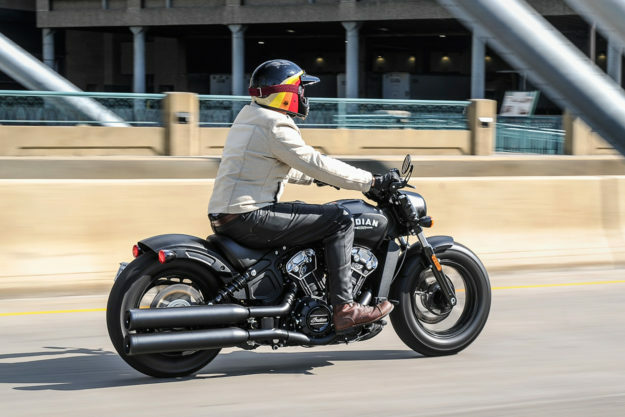 On the Scout Bobber launch I was seriously concerned about how well the wool would breathe: temps in Minneapolis were boiling the mercury to the mid-nineties. To my surprise, the jacket actually ran cooler that I imagined. Did I sweat? Sure, but everybody was dripping on that ride, regardless of what layers they were sporting. Back home in Toronto I’ve had the Bomber out in a range of temperatures and the wool regulates things nicely. It even stands up to the odd downpour here and there, although it won’t replace my Aerostich for torrential rides. 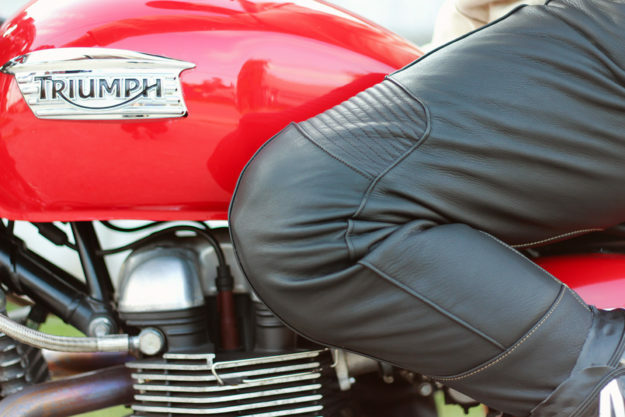 Pagnol M3 Pants Paulo Rosas has an undying passion for motorcycles. He has a history of involvement in the motorcycle industry and regularly rubs elbows with Southern California’s most celebrated builders. He also has roots in fashion and design. So it should come as no surprise that his line of products, produced under the Pagnol Motor banner, tick every box for performance and style. 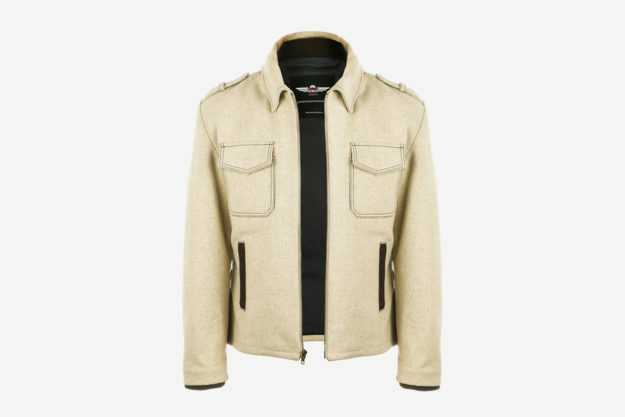 Rosas’ work first grabbed my attention when the M1 Moto Jacket was featured on this very site . Needless to say, I had to have one and I’ve kept a keen eye on every piece of Pagnol gear that’s has come out since. Leather pants are a tough sell. Unless your name is Jim Morrison, the thought of plunking down on bovine strides probably hasn’t crossed your mind. But as a rider, the abrasion protection afforded by leather is superlative, so maybe it should. So, in the name of science, I decided to give the M3 pants a try, to see if they’d channel my inner Lizard King—or have me ending up like Ross on Friends. First things first: anybody concerned about access and egress issues should know that the M3 comes equipped with a ventilated lining. (Trust me when I say this is a good thing, especially after the 90-degree ride through the Land of Lakes). It maintains airflow and works as a wicking layer, doing a great job of preventing you and your pants from becoming one. The M3 has ‘accordion’ paneling at the knees to allow for flex in the saddle, and has interior pockets at the hips, tailbone and knees, designed for slim fitting armor. Pagnol recommends SAS-TEC stuff but, again, D30 products slide in without any worries. The leather itself is 1.2mm tumble-aged cowhide that has a robust yet buttery smooth feel to it. It’s the styling of the M3 that makes them a standout item, though. If you have memories of the racers of yore, you’ll spot the inspiration: it’s a classic style that wouldn’t look out of place on Mike Hailwood on the Isle, and it lends itself to the current trends in riding gear. Added features not common to retro-racers include functional pockets both front and rear—which are zippered for stowage and belt loops to customize fit. Outside of my racing onesies, the M3 is the only leather legwear I currently own, so comparing it to anything similar is kind of tough. In terms of fit, these pants are as comfortable as a well worked-in pair of jeans, and sizing is true. I wear a 34 in Levis and the same works here. They do have a slim fit though, so if you want extra room, sizing up is a good idea. Model images: Barry Hathaway (Indian Bobber) and Carolyn Merey.